Hummer is an off-road racing game from Sega. The game is licensed by General Motors and puts you behind the wheel of a Hummer SUV. Players must navigate a variety of different terrains including snow, mud, and dirt. The deluxe cabinet is modeled on the rear end of an actual Hummer, and features a motion base. The deluxe cabinet is modeled on the rear end of an actual Hummer, and features a motion base. 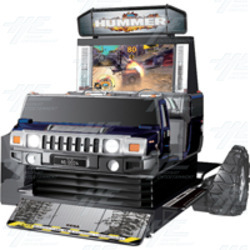 Gameplay footage of upcoming arcade game Hummer from Sega, taken from the AM Show 2008.